Open your spigot and one or two shut off valves to control water flow what you needed. Please choose correct size of hoses. To prevent leaking, please ensure rubber ring at the connector. Please don't beat hose splitter. It may broken if it has a beating phenomenon during use. Please change a new washer if it leaks after using for a long time, 4 rubber rings in the package to replace. Do remove it from your spigot when the weather turns cold. Prevent it being freezing. Seamless installation and smooth operation: The 2wayz Garden Hose Separator has a long handle (4 cm!) that can be closed and closed smoothly and easily. Because the shunt is coated with rubber, it is ideal for stiff hands or hands with arthritis. In addition to a basic understanding of how faucets and hoses work, no tools are required to ensure easy installation. The separator can also be rotated 360 degrees, allowing you to pull and pull the hose in all directions. No more leaks. No more waste. These two nozzles are now fixed with metal bolts and will not break. The neck is threaded and the two parts are permanently fixed. The long, smooth threads at the ends of the female have rubber loops that make the leak a long-forgotten experience. Durable and recyclable: The hose splitter is made of high quality zinc alloy and plastic with a comfortable rubber handle. Never worry about the way the hose shunt 2 will rust. 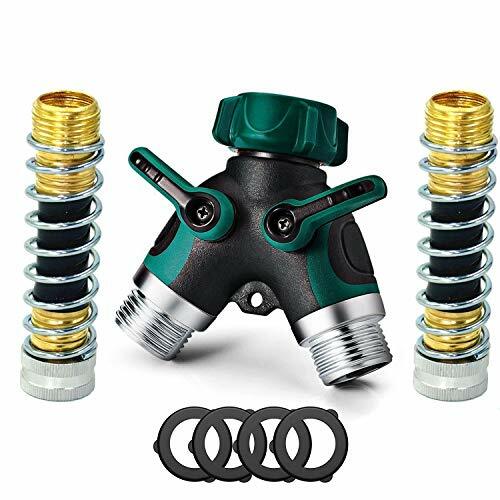 Two-way Y-type hose separator: The garden hose separator has 2 connectors and 2 valves. With a water separator, a faucet can be easily converted into two high-flow water sources. It can make your garden life easier. Easy to install: Rotate the connector only when the hose separator is connected to the faucet. No tools required. If you have any questions about this product by SPWIS, contact us by completing and submitting the form below. If you are looking for a specif part number, please include it with your message.